Panicum leucothrix. Emily DeCamp Herbarium. emilydecampherbarium. Rutgers University. rutgers.edu (Accessed 5/2014). Dichanthelium leucothrix is a perennial C3 grass (Aliscioni et al. 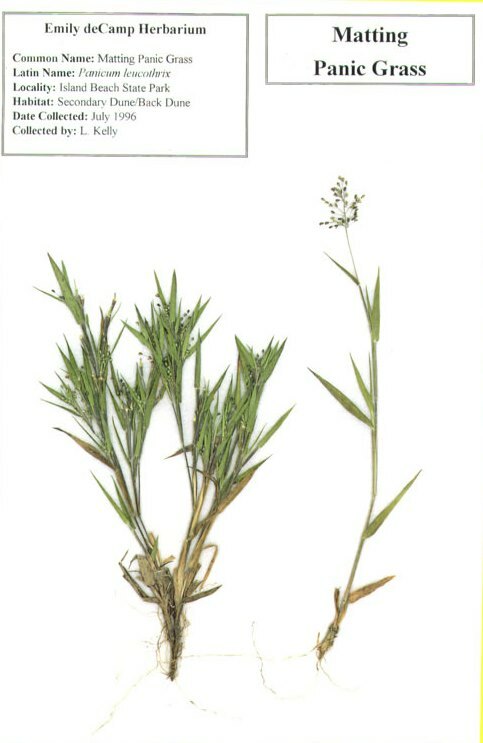 2003), to 40 cm, pale dull green, often reddish, most parts hairy, stems erect to reclining, densely tufted, autumn phase prostrate, forming mats, copiously branched from all nodes, hairs on some sheaths and internodes of 2 types, short and long together, ligule a single band of hairs 0.1-0.4 cm. Flower spikelets finely hairy, 0.1-0.2 cm, less than half as long as 2nd glume; inflorescence 6-10 cm, narrow, autumn phase spikes 1-2 cm, often hidden in branches. Habitat: Open, dry sandy soil. Notes: Seeds of Panicum sp. eaten by many birds, foliage eaten by Muskrats and rabbits (Martin et al. 1951).